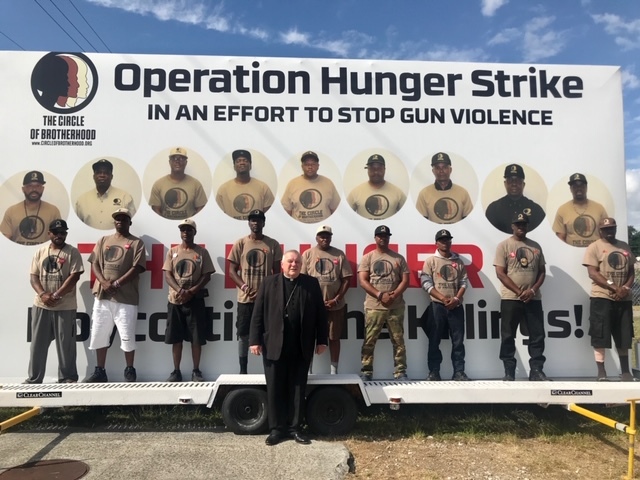 Archbishop Thomas Wenski on March 24 visited the site of Operation Hunger Strike, a protest against gun violence in urban communities staged by nine men affiliated with a group called The Circle of Brotherhood. The men ended their strike March 29, saying the news and social media attention had made a difference. Archbishop Thomas Wenski on March 24 visited the site of Operation Hunger Strike, a protest against gun violence in urban communities staged by nine men affiliated with a group called The Circle of Brotherhood. Here he stands next to the clothesline hung with T-shirts bearing the faces of people killed by gun violence. 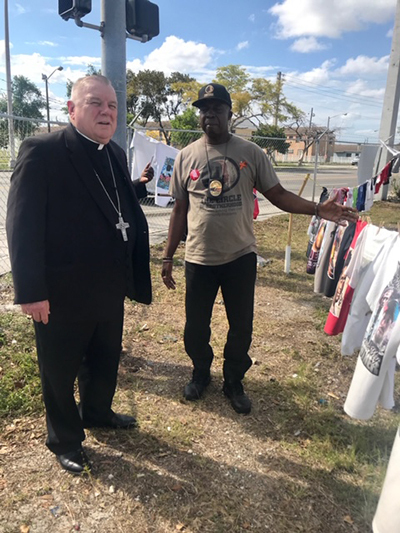 MIAMI | Archbishop Thomas Wenski on March 24 visited the site of Operation Hunger Strike, a protest of gun violence in urban communities staged by nine men affiliated with a group called The Circle of Brotherhood. The Hunger 9, as they call themselves, wanted to call attention to the high number of people killed and maimed by gun violence in places such as Miami's Liberty City, where they staged the three-week strike. The men ended their strike March 29, saying the news and social media attention had made a difference. “I think it's already changed, we are seeing a change already because people are actually talking about it,” Leroy Jones, one of the protesters, was quoted as telling Local10 News. 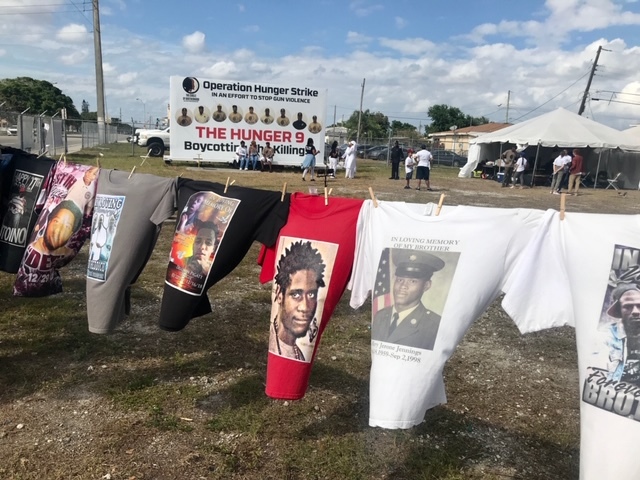 Images of victims of gun violence in urban communities hang on Tshirts at the Liberty City site of Operation Hunger Strike, staged by nine men who are part of a group called The Circle of Brotherhood. The Hunger 9 ended their strike March 29, saying the news and social media attention had made a difference. Archbishop Wenski visited the men March 24.